Pandavas ruled Hastinapura Kindom for almost 36 years and after that finally, they came to know it is time to leave this world and to got to swarga loka. So Pandavas started their journey towards swarga loka. 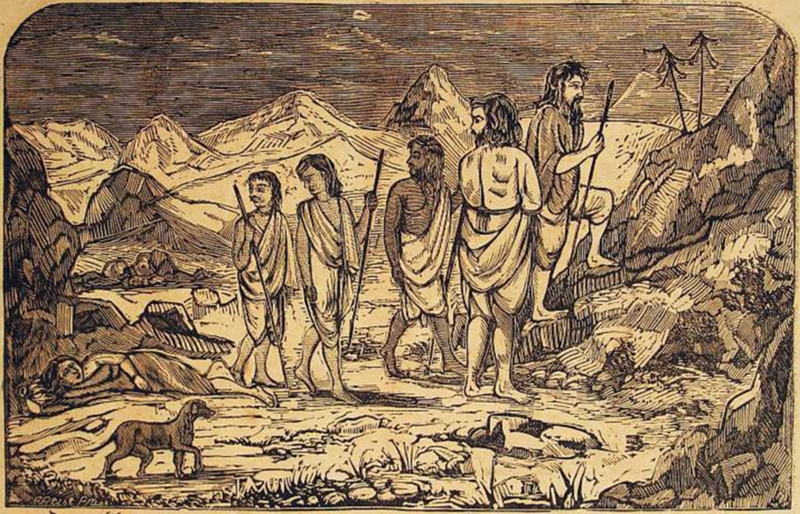 Pandavas along with their wife Draupadi continued their journey. Totally 6 members were going. As they came to cross the forest one dog joined and followed them. So now totally 7 members were continued their journey. They started climbing Meru Mountain which would lead them to swarga loka. As the journey continued suddenly Draupadi fallen down from the mountain and died. By seeing this Bhima asked Yudhistira "Why Draupadi was fallen down even though she did not do any sinful acts??". Yudhistira said like this "Even though we all five were equal to her but she always showed partially and more love for Arjuna. So today she got her karma, so she was fallen down". After sometime Sahadeva fallen down and died. Then Bhima asked Yudhistira "Why Sahadeva was fallen down even though he was the person with great humility and served to us all always??". Yudhistira said like this "Sahadeva always thought like that he was the most intelligent person and no one would match with him and he always prided on his knowledge, so he was fallen down". After sometime Nakula fallen down and died. Then Bhima asked Yudhistira "Why Nakula was fallen down even though he always obeyed to his elders and having more good qualities without incompleteness??". Yudhistira said like this "Nakula always thought like that he was the most beautiful person and he always though no one would match with his beauty, so he was fallen down". After sometime Arjuna fallen down and died. Then Bhima asked Yudhistira "Why Arjuna was fallen down even though he never lied anything in his life and did not do any adharma acts??". Yudhistira said like this "Arjuna always jealous of other archers and warriors and he was proud of his strength and heroism, so he was fallen down". 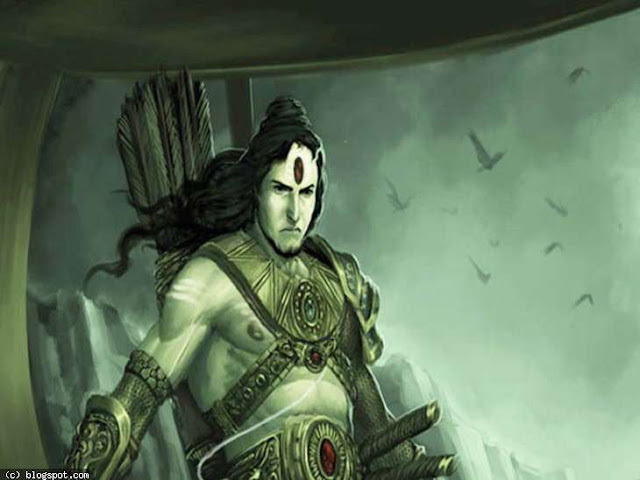 Finally, Bhima was going to fall while falling Bhima asked Yudhistira "Oh brother Yudhistira I am the lovable person for all people and friendly with all people why I was going to die??". Yudhistira said like this "Oh Bhima you were the great foodie and great eater and you never thought whether others want food or not while you were eating. You have always shown greed in excess of eating, so you were fallen down". Having said these words the mighty and great Yudhistira continued his walk without looking back. Now he has only one companion that is the god which followed them in the forest. Suddenly Indra appeared with his chariot and asked Yudhistira to jump into the chariot and we both would go into the heaven and no need to walk. Then Yudhistira said I could not enter heaven without my brothers and wife. Then Indra said they already died and entered heaven so you need to come now. Then again Yudhistira asked Indra like this, "This dog who is my friend can jump into chariot". Then Indra replied dogs are not allowed entry into my chariot only you can enter. Yudhistira refused to enter the chariot without the dog because he was his friend who was with him along the whole journey and I could not leave him here because this is a sinful act. By seeing Yudhistira's dharma and commitment dog transformed into original form who was nothing but the Lord Yama, who was the father of Yudhistira. Yama was mighty impressed with the great qualities of Yudhistira and praised him. Then Yudhistira happily jumped into the chariot and went into heaven along with Indra. In this way, Pandavas die while going to swarga loka.